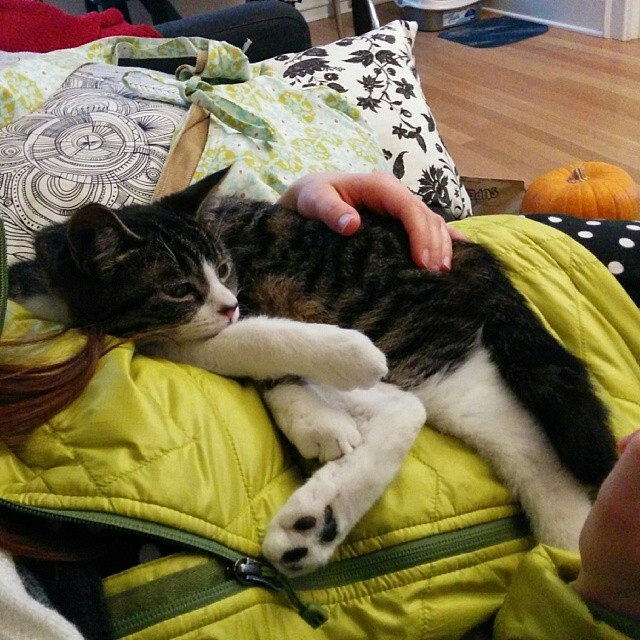 A few months ago, Tracey and I introduced a cat into our apartment. Although I never found time to write about it at the time, the whole experience has been a large episode in learning whole new things about animals. It was something we’ve been discussing for a quite a while. Although I may have issues with some cats, I generally like them for their independent nature and feline-like craziness and cuteness. They generally tend to themselves, and retain a lot of instinctual qualities that make them largely hands-off. With a cat, the equation is pretty simple: in exchange for food, the cat will provide warmth and entertainment. And eats spiders and/or rodents that will intrude into our apartment. In theory. After purchasing all sorts of things we thought a cat may need prior to adopting one, we grabbed the kitty carrier and rode a bus to the Seattle Animal shelter (which is, oddly enough, located in Bellevue). We walked from the park and ride to the shelter, and were suddenly faced with a very noisy and crowded place. It was, to use no other better description, chaos. We were fairly overwhelmed and after deciding that the cat would pretty much hate us forever if we took it back on the bus, decided to come in at opening the following day, which was Sunday. Grabbing a zipcar and arriving at opening, it was a much calmer experience. After an hour playing with the younger cats in one of the rooms, we found a friendly 6 month old that seemed to like us. After doing some questionable driving techniques (the zipcar reservation was quickly running out), and Tracey yelling “did you just say ‘yolo it’ while driving with the NEW CAT?,” I managed to park the ever-maneuverable Audi A3 with only a minute to spare. We come home, let the cat out of her cage. And she promptly hides in a pile of clothes. A good half hour later, we cajole her to get into the living room, where she then decides to spend the next day hiding under our TV center. She has selected this as her bed, it seems. And then decided to sleep in her urine. Things were off to a good start. After much cleaning and enzyme sprays later, the smell was removed. And she didn’t really have a name yet. The prior name, Cassidy, was pretty much immediately vetoed by us. After a week or so, she decided to start eating. Just in time for her to get a kitty cold. Which involved, in case you never experienced such a thing, a very bubbly nose, runny eyes, and a generally pathetically congested meow. Another week of the cold, and she finally started to eat (yay!) and venture out (yay!). 1) Are the humans on the couch? 2) If yes, walk up to them and headbutt them in the head as hard as possible. 3) Walk back to cat bed. Regardless of the learning curve, she’s a very well settled animal now, and even got the name of Minerva. Half after the goddess, and half after the Harry Potter character.